The Warren County Board of Developmental Disabilities provides supports to more than 1,800 people with developmental disabilities who live in Warren County, Ohio. This video describes these supports, and tells the stories of those whose lives we touch. The School to Adult Life Transition seminar Navigating Social Security is for parents of teenage children who have developmental disabilities. This seminar was held in Lebanon, Ohio on October 26, 2016, and was hosted by the Warren County Board of Developmental Disabilities. The presentation covers differences in current Social Security benefits, how to navigate through the Social Security process, and the time lines of what to do and when for children with special needs. On September 28, 2016, the Warren County Board of Developmental Disabilities hosted the School to Adult Life Seminar, where the topic was “Difference Makers DRIVE Change: You Got the Power.” Parents of teens with developmental disabilities were presented with the five key principles that “Difference Makers” embrace and practice to change the world around them. On May 25, 2016, the Warren County Board of Developmental Disabilities hosted the School to Adult Life Seminar, where the topic was “Organize Your Transition.” Parents of teens with developmental disabilities were provided a binder of materials and resources, and instructions and guidance on how to get organized for the transition journey. On May 2, 2016, WCBDD Superintendent Megan Manuel discussed impending changes with Adult Services at Production Services Unlimited, Inc. (PSU) Her presentation covered what is happening with adult services in the Ohio developmental disabilities system, its impact, and how the WCBDD and PSU plan to address those changes and requirements. On April 27, 2016, the Warren County Board of Developmental Disabilities hosted the School to Adult Life Seminar, where the topic was a Discussion Panel. Parents of teens with developmental disabilities, as well as a young adult with developmental disabilities discussed their challenges and successes of the transition period from the teens to young adulthood for those with developmental disabilities. The Warren County Board of Developmental Disabilities helps people with disabilities find employment in the community. Check out this 30-second T.V. commercial that features Brian, who has a disability. Brian is a valued employee at Walmart where he works as a Greeter. This T.V. commercial is currently airing on Local 12 WKRC Cincinnati this entire year of 2016. The School to Adult Life (SALT) seminar held on March 23, 2016 focused on: How employment impacts Social Security benefits for those with developmental disabilities. This seminar was held at the Warren County Board of Developmental Disabilities in Lebanon, Ohio. The Warren County Board of Developmental Disabilities held an Open House at the Warren C. Young Center on March 3, 2016. Alex Kovacs was the featured speaker who discussed his life and shared details about living each day successfully. The Warren County Board of Developmental Disabilities held an Open House on March 3, 2016. The featured speaker was Crysta McCray, mother to a young son diagnosed with Autism. Crysta talks about her experiences and challenges of parenting her son. The Warren County Board of Developmental Disabilities hosted the Regional Transportation Options seminar to help educators and care providers find reliable transportation for people with disabilities. Representatives from the following agencies participated; Miami Valley Regional Planning Commission, University of Cincinnati – University Center for Excellence in Developmental Disabilities, Capabilities, and CareGo. This seminar was held on March 1, 2016. This video is part two of two videos, as a short break was held in between speakers. The Warren County Board of Developmental Disabilities hosted the Regional Transportation Options seminar to help educators and care providers find reliable transportation for people with disabilities. Representatives from the following agencies participated; Miami Valley Regional Planning Commission, University of Cincinnati – University Center for Excellence in Developmental Disabilities, Capabilities, and CareGo. This seminar was held on March 1, 2016. This video is part one of two videos, as a short break was held in between speakers. The School to Adult Life Transition seminar was held on February 24, 2016 at the Warren County Board of Developmental Disabilities. The topic was Recreation and Leasure Night. Families were introduced to recreational opportunities available to children and adults with developmental disabilities. The Warren County Board of Developmental Disabilities helps people with disabilities find employment in the community. Check out this 30-second T.V. commercial that features Carla, who has a disability. Carla is a valued employee at AMC Movie Theatres where she works as a Greeter and Ticket-Taker. This T.V. commercial aired on Local 12 WKRC Cincinnati during the summer and fall of 2015, and during the Super Bowl in February 2016. On January 27, 2016 a School To Adult Life Transition (S.A.L.T.) seminar was held at the Warren County Board of Developmental Disabilities. The topic was Guardianship, Wills and Special Needs Trusts. The presenter was Richard Dusterberg, Attorney at Law. Mr. Dusterberg discussed what families should know regarding legal information involving people with disabilities. Megan Mahoney, who receives services from the Warren County Board of Developmental Disabilities is the featured speaker at the Transition Living Classroom to discuss the positive benefits of working in the community. Rebekah Doak of the Warren County Board of Developmental Disabilities provided an Autism training to First Responders with the Middletown Fire Department. Check out this great news story that aired on WLWT News on December 2, 2015. The Warren County Probate and Juvenile Court held a special presentation in December of 2015 to promote and discuss the benefits of hiring people with disabilities. Presenters included; Judge Joseph Kirby, Warren County Probate and Juvenile Court, Megan Manuel, Warren County Board of Developmental Disabilities Superintendent, Tom Isaacs, Warren County Educational Service Center Superintendent, and Megan Mahoney, Warren County Probate and Juvenile Court File Clerk. Lori Horvath, Deputy Director of the Ohio Department of Developmental Disabilities, Medicaid Development & Administration gives a presentation at the Warren County Board of Developmental Disabilities about the State’s New Level of Care and its roll-out. Presented on April 28, 2015. The Warren County Board of Developmental Disabilities held their second annual community egg hunt for children with developmental disabilities on March 29, 2015. 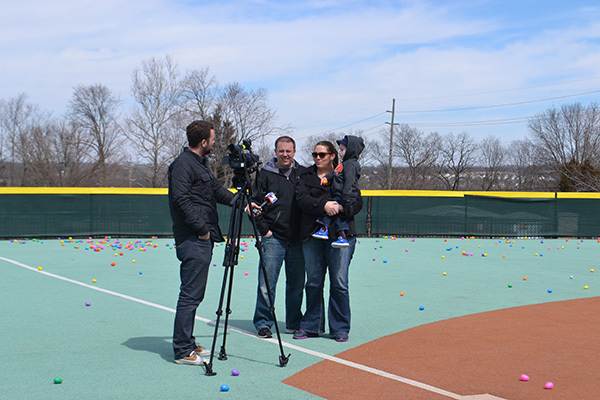 More than 100 families participated in this event which was held at the Miracle League Field in Springboro, Ohio. Check out this clip about the event that aired on WDTN News! The School to Adult Life Transition (SALT) seminar Navigating Social Security is for parents of teenage children who have developmental disabilities. This seminar was held in Lebanon, Ohio on January 28, 2015, and was hosted by the Warren County Board of Developmental Disabilities. As part of the School to Adult Life Transition (SALT) series, participants attending this event will learn about various services and supports provided by the Warren County Board of Developmental Disabilities to individuals with disabilities. The Warren County Board of Developmental Disabilities is located in Lebanon, Ohio. Filmed in October 2014. The Warren County Board of Developmental Disabilities held a community egg hunt for children with developmental disabilities on April 13, 2014. More than 100 families participated in this event which was held at the Miracle League Field in Springboro, Ohio. Check out this clip about the event that aired on WDTN News! The Warren County Board of Developmental Disabilities provides service and support to more than 1,500 people with developmental disabilities who live in Warren County. Check out this video to learn more about our agency.